If you think writing your first novel and selling it to a publisher is hard, just wait until you get to your second novel. There is indeed such a thing as the sophomore-novel syndrome. The challenges are real, but they are not insurmountable, as I’ve learned first-hand. I agree that the first book is exhilarating. It’s your free pass to publishing. Your lack of experience gives you some freedom. People don’t have set expectations of you yet. The second book, however, requires everything you invested (time, effort, dedication) the first time and then some. My first book-length work of fiction was an experiment born out of desperation. “In His Corner” is a short contemporary romance book I wrote under my pen name, Vina Arno. I wrote it at a feverish pace within five months after a trip to Italy. It was acquired (unagented) after four months of submissions. Lyrical Press published it in 2015. For 18 years before that, I’d been writing women’s fiction and historical novels without success. Sheer momentum propelled me to write my second romance book one month after finishing the first. What happened next is best discussed as lessons. 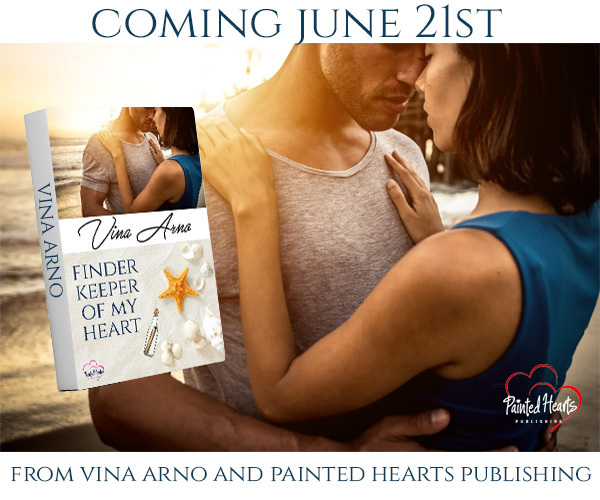 Today, Painted Hearts Publishing is revealing the cover of “Finder Keeper of My Heart,” my second romance book (also under my pen name). In honor of the occasion, I’d like to share the top three lessons I learned from its publication. #1 Write, write, and write some more to overcome the second-novel syndrome. After the euphoria of my experimental foray into the romance genre, I was plagued by uncertainties and insecurities. Was the acquisition of my first book a fluke? Will I ever get published again? While I was able to start writing my second novel immediately, I failed to sustain the brisk pace I had experienced with the first book. “Finder Keeper” took almost three years to finish. Painted Hearts Publishing acquired it on April 13, 2018. Bottom line: I continued writing despite rejections, the end of my relationship with a literary agent, and other obstacles. The act of writing itself saved me from falling into the second-novel trap. #2 Tame your high expectations. The flip side of a writer’s insecurity is overconfidence. After the publication of my first book, I thought I would get published just as fast the second time around. I was wrong. I learned it the hard way when my first publisher rejected my agented submission. Since then, I treat every manuscript like my first. I focus on the writing and the querying process. I set more realistic expectations. The acquisition of “Finder Keeper” by Painted Hearts Publishing is one of the greatest rewards I’ve ever experienced as a writer. #3 Don’t drop the ball after the first book. The contract for my first book required me to establish an online presence. In a very short time, I built a website and a blog, joined Goodreads and Facebook, and set up an Amazon author’s page. It was a steep learning curve for me. While I was finishing “Finder Keeper” and submitting an older manuscript (a historical novel called “My MacArthur”) to publishers, I dropped the ball on social media. I neglected to upgrade my website and join other platforms. By the time I got a book offer for “My MacArthur” and “Finder Keeper” in quick succession this past April, I was scrambling to update my website and make up for the other things I’d neglected. I joined Twitter and Instagram quite late. Better late than never! Every publisher today expects authors to maintain an active online presence. If you plan to write over the long haul, spend the same amount of zeal and attention on each book. It’s the best way to fend off the dreaded sophomore-novel syndrome. Read an excerpt of Finder Keeper of My Heart. Learn more about Finder Keeper of My Heart. Lear more about Painted Hearts Publishing. Cindy Fazzi is a Filipino-American writer and former Associated Press reporter. She has worked as a journalist in the Philippines, Taiwan, and the United States. Her short stories have been published in Snake Nation Review, Copperfield Review, and SN Review. Her first romance book, In His Corner, was published by Lyrical Press in April 2015 under the pen name Vina Arno.